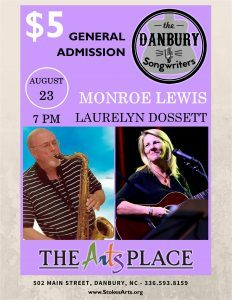 The Danbury Songwriters series welcomes Monroe Lewis and Laurelyn Dossett to the stage at The Arts Place of Stokes on August 23, 2018. Monroe “Monk” Lewis has played the saxophone since the 1960s with famous beach bands across the South including the Casuals, the Fabulous Five, the Note-tations and many others. He was inspired by none other than the legendary Boots Randolph and now pays tribute by performing many of Boots Randolph’s familiar hit songs. Laurelyn Dossett lives and writes in the piedmont of North Carolina, and her songs tend to reflect the stories of the region, both traditional and contemporary. One of the most sought-after voices in creative collaborations, she has toured with Rhiannon Giddens, folk legend Alice Gerrard, composer/violinist Daniel Bernard Roumain, composer Kenneth Frazelle’s and the North Carolina Symphony. Tickets for Danbury Songwriters are $5 and available ONLINE , by phone at 336-593-8159 or at the door.